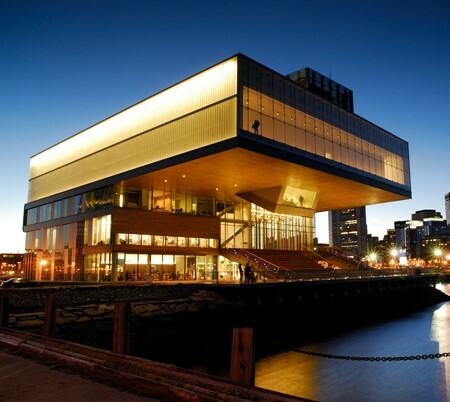 The Institute of Contemporary Art in Boston MA. Designed by Diller Scofidio and Renfro. Saved from architecturerevived.com. From bbaunach’s flickr account. The WWE starts us off a video package on Dean Ambrose and Seth Rollins. They are in the ring first. Ambrose wants to know what the deal is. Rollins tells him they can run the WWE if they fight together. Rollins holds out the fist again. Ambrose still doesn’t bite after milking the crowd. Rollins has another plea for Ambrose by saying their differences are their strength as a team. Ambrose puts the fist out. Rollins turns away. They start to brawl. Sheamus & Cesaro come down and attack both of them. Ambrose got dumped first. Rollins got attacked second. Ambrose tries to make the save but starts getting beat down. Ambrose & Rollins finally take out Sheamus then Cesaro. They finally put their fists together. The crowd is loving it. Kurt Angle and comes out and makes the match official. Nia Jax comes out for her match against Sasha Banks. Alexa Bliss comes out and sits in a life guard stand at ring side. Jax squashes Banks against the ropes quickly. Banks goes for a head scissors take over but gets swung into the barricade. Banks kicks out when she gets tossed back into the ring. Jax follows up with a leg drop. Still two. Banks locks in a sort of Camel Clutch. Jax drops backwards for a Samoan Drop. Banks gets her arm under the ropes. Jax Samoan Drops her again. Banks rolls out of the ring. Jax throws her back in. Jax misses an elbow drop. Jax is going for a Superplex. Banks fights out and kicks out Jax’s legs. Double knees. Banks knees Jax in the corner. Banks runs into a big boot. Jax is lax so Banks reverses into a Bank Statement. Banks changes arms to keep Jax from the ropes. Jax picks her up but Banks turns it into a Tornado DDT. Bank Statement again for the tap out win. Matt & Jeff Hardy try to talk to Kurt Angle. The Miz and the Tourage come in and complain. The Miz will be taking on Jason Jordan tonight. Evidently Bray Wyatt and Finn Balor have a thing but it can wait until after a commercial. They’re brawling back stage so they get a match tonight instead of Summerslam. Elias Samson is in the ring. R Truth interrupts him today. This opponent makes more sense for Samson. It isn’t a match. Just a beat down. Huh. The WWE really seems to be making up for two long-ish segments. Big Cass is milking the boos with a shark cage behind him. I’m surprised people care this much. He knows Enzo Amore need the back up from Big Show. Show needs Enzo to stay relevant. Cass wants to prove he’s the best big man in the game today. Enzo finally comes out. He points out that Cass has been KOed 2 weeks in a row. Big Show comes out. He starts a fight with Cass. Luke Gallows & Karl Anderson are now Big Cass’s lackeys. Didn’t think I’d ever type those words. Show’s hand gets slammed into the shark cage. Akira Tozawa comes out with Titus O’Neil to take on Neville for the Cruiserweight Championship. Neither guy gets much of a reaction. Tozawa gets the upper hand early. Neville is in control after the break. A Belly to Back Suplex gets Tozawa momentum again. Suicide Dive. And another one. Neville stops Tozawa on the top ropes. Suplerplex by Neville hurts both of them. Tozawa connects with an enziguri. Neville uses the ref as a shield. NEville gets on the Rings of Saturn. Tozawa turns it into pin. Neville yanks Tozwa into the middle turn buckle. Neville misses a Red Arrow. Senton Bomb for the Tozawa win. Titus Worldwide. Apollo Crews comes out to celebrate. Booker T has his wits about him tonight. This victory was not Buster Douglas level surprise. Big Show tells Enzo Amore that he isn’t going to miss Summerslam. I’d rather watch Tozawa vs Neville again than Cass vs Show. Mickie James has to listen to Emma babble. James reminds Emma that she tapped out and wasn’t screwed. James wants a match with Emma. She agrees. Why didn’t a short skit like this happen before with both of these women who have nothing to do? Finn Balor & Bray Wyatt are fighting back stage but both do full entrances. that makes no sense. They do resume their brawling ways once the bell rings. An overhead kick is the first big move of the match. Balor uses his speed to get the upper hand. Wyatt does his side ways spear. Balor fights out of a Urinogi. Balor connects with Sling Blade. Wyatt with a senton. Balor with a Double Stomp from the mat. Balor drop kicks Wyatt into the barricade. Balor rolls him back in. Balor goes for the Coup de Grace. Wyatt catches him on the top rope. Sister Abigail for the win. Whose Wheaties did Balor piss in? Wyatt gives him another Sister Abigail. Wyatt dumps thinned out red pudding on Balor who has to pretend it’s blood. People in special effects must never cut themselves. Emma and Mickie James have their match. They need to put their name on the map with a victory. You can’t win if you’re not put in a match. Emma works over James, who had a short spurt of offense to start the match. James gets a big boot up but can’t capitalize. Emma pulls her off the middle rope. Mick Kick for the win. Holy cow, Michael Cole seemed genuinely surprised about that. It’s one of her signature moves. Finn Balor badly wants a shower because he is so sticky. Balor is going to bring out his “Demon” at SS. The Miz comes out with Maryse, Curtis Axel and Bo Dallas. The Miz did not help teach Jason Jordan anything on the microphone this week. Jordan looks to be making short work of The Miz when Axel & Dallas interfere causing the DQ. The Hardyz make the save. The six man match happens tonight. I expected it to make it on the pre-show of SS. Jordan has been the focal point of the match with him both on offense then selling. Matt gets a hot tag against Axel. He ends up selling. Jeff then gets his hot tag against Bo Dallas. Whisper in the Wind leads to a direct pin. The Miz distracts Jeff. Dallas with a Cross Rhodes with Jeff hung up on the top rope. Jordan takes out The Miz & Axel. Twist of Fate followed by a Swanton for the win.